In the Republic of Macedonia, the climate is cold in winter and hot in summer. The continentality of the climate is due to the fact that the country has no outlet to the sea, and in addition it's separated from the Adriatic and Aegean Seas by mountain ranges. The major cities are located at an altitude higher than sea level, often in valleys, which enhance the cold in winter (because cold air stagnates on the ground) as well as the summer heat. The Balkan Peninsula is exposed to cold waves from the north or east, and Macedonia is no exception. The north-west wind which blows in the valley of the Vardar is called Vardarec, an equivalent to the Bora, maybe a little less violent. In the far south-east, we find an area located south of the mountain ranges that separate the country from the sea, where there are cities like Gevgelija and Valandovo, as well as Lake Dojran. Here the climate is milder, almost Mediterranean. In the mountain areas, in particular the Shar mountains in the north-west and the Baba mountains in the south-west, which both exceed 2,500 meters (8,200 feet), the climate is naturally colder, with heavy snowfalls in winter and afternoon thunderstorms in summer. In general, at a given altitude, the temperatures in winter are similar to those of the Alps. Here are the average temperatures of Skopje, the capital, located in the north, at 250 meters (800 ft) above sea level. Precipitation is not abundant in the valleys, where it amounts to about 500 millimeters (20 inches) per year, while it becomes a bit more abundant with increasing altitude. In general, the two rainiest seasons are late spring and autumn, while winter and summer are relatively dry. Here is the average precipitation in Skopje. Winter in Macedonia is generally cold, although the temperature varies with altitude. The average temperature in January is around freezing (0 °C or 32 °F) at the lowest altitudes. In Skopje, which as mentioned is located at 250 meters (800 ft) above sea level, the average in January is 0 °C (32 °F). The winter weather is not always stable: there are calm periods, when cold air clings to the soil, alternating with mild days, when warm air masses from the Mediterranean manage to penetrate the country, and with periods of intense cold due to outbreaks of air masses coming from Russia, when the temperature can plunge to around -20 °C (-4 °F). Summer is hot in the valleys located at lower altitudes (eg in Skopje), where the maximum temperatures are usually around 31 °C (89 °F). The temperature range is high and moisture is not high, so nights are usually cool, but days can be scorching, with peaks of 40 °C (104 °F). Sunshine is frequent, and the rains are relatively rare, occurring in the form of thunderstorms in the afternoon. The sun in Macedonia often shines in summer, while in winter it is not very frequent. The best time to visit the Republic of Macedonia is from May to September. 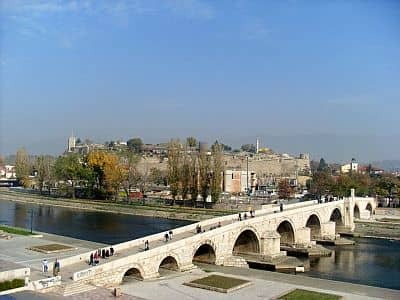 In Skopje and the other cities located in the lowlands, the months of July and August (and sometimes the second half of June) can be really hot, so you may prefer May, June and September. September is usually a pleasant month, sunny and with little rain. In summer: bring light clothes, a T-shirt, but also long pants, a light jacket and a sweatshirt for the evening; an umbrella.